The ceremony started at 17:30. We prayed for the good harvest in Autumn. 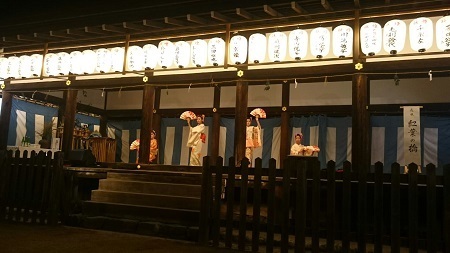 Kyoumai (=traditional Kyoto Dancing) and music were offered. I was invited to “Kangetsu-sai” at Kamigamo shrine. and there is a record of having a big moon viewing party during the reign of Emperor Uda (887-897) in Japan. 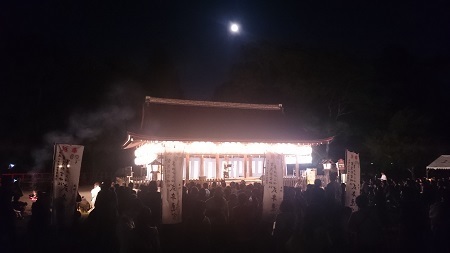 After the Edo period, common people also started appreciating the moon with offerings such as dango (=sweet rice dumpling), edamame, Japanese pampas grass and sake. Many poems from those old days are found at Kamigamo shrine. Matsu hodo ni kokoro asakumo omou kana. Hikari saya keki yonayona no tsuki. While many people were watching, the ceremony proceeded and we could view the brightly shinning full moon over the roof of Baba-den. It is said that in the old days, aristocrats did not watch the moon directly but enjoyed its reflection on the lake. After all, it was a time without electric lights. People must have felt at ease under the bright moonlight and I suppose that is why they prayed or made a wish upon the moon. I appreciated the glorious time at Kamigamo shrine.